Combine honey and ginger in a blender and blend on high until smooth. Put ginger-honey mix aside. In same blender, blend sun-dried tomatoes with lemon and spices until smooth. 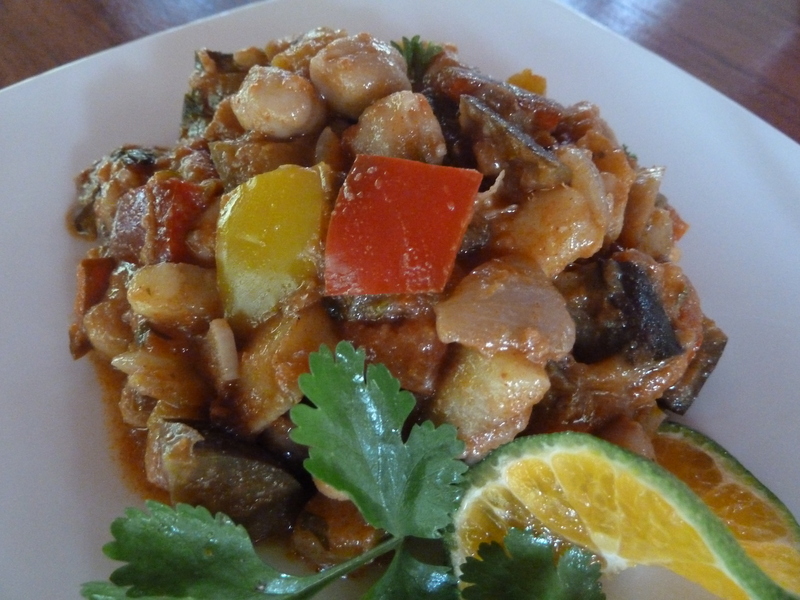 In a deep heavy bottomed casserole or stew pot, heat one tablespoon of oil and add eggplant, stirring quickly to coat. Cook for 5 – 10 minutes, stirring occasionally until eggplant cubes begin to sear and tenderize slightly. Remove from pan. Saute onions in remaining 2 T oil and a pinch of salt until translucent, add garlic and saute for 5 – 10 minutes until mixture begins to caramelize slightly. Deglaze pan with a tablespoon or so of water if needed. Add sundried tomato sauce, fresh tomatoes. Bring to a boil on medium heat and add sweet potatoes. Cover and simmer 20 minutes, stirring occasionally until potatoes are just tender. Add peppers, eggplant, chickpeas, currents and half the honey-ginger mixture. Check for salt and pepper and adjust as needed. Simmer gently, covered, for 45 minutes to an hour, stirring occasionally to make sure all the veggies get immersed into the sauce. Remove from heat, stir in remaining ginger mixture and cilantro and serve with cooked couscous, barley or quinoa. * A Note About Barley: Barley has a wonderful chewy bite which I prefer to couscous, and although there is a small amount of gluten in barley, it is apparently a different type and more easily digestible than wheat gluten so could be a better choice for those who are not celiac or highly gluten sensitive.